This delightful small growing species is endemic to Sumatra where it grows from 1550 to 3050m. This is the first flowering of a seedling plant with small dark pseudobulbs which are thin at the base and thicker near the end where they flower. We grow the species in our Warm Asia section but in light of the high altitude it would be happy a little cooler. 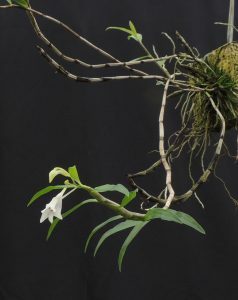 We have nearly fifty dendrobium species in our collection and this wonderful diverse genus includes many of our most flamboyant orchids as well as delicate species like this one. Walking around the greenhouses today we identified several dendrobiums in bud that will flower for our many shows this spring so look out for some lovely species over the next few weeks. 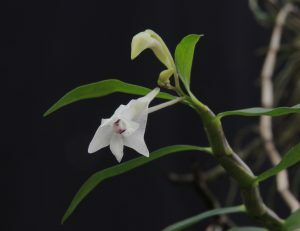 We also have a number of dendrobium species seedlings in our lab and this Friday will be sowing several new species as part of our work with a project we are keen to support in Myanmar. Full details later in the week.